(244, 'Robot Learning Through Virtual Reality', 'Trivia', 'Robots have been a large contributor in many industries for many years especially with repetitive tasks involving functions such as grabbing objects and using that function to perform more advanced and helpful functions. The problem, however, is that today\'s robots are programmed to move and work with every single detail related to the task such as what to grab and how to grab it, what to do with it, and many more. Even after many hours of programming, typical robots will only be able to do a singular task again and again. Pieter Abbleel from UC Berkeley announced that Embodied Intelligence, a new startup, will “enable industrial robot arms to perceive and act like humans instead of just strictly following pre-programmed trajectories”.\r\n\r\nEmbodied Intelligence is currently in the process of creating technology in which a single robot will be able to perform wider range of task by using deep reinforcement learning, deep imitation learning, and few-shot learning. The results are robots capable of learning, from humans through virtual reality as a meduim, new tasks in a much shorter time. The robot learns a new task simply through a person demonstrating new tasks like tying a knot. The robot will then generalize the demonstration and apply it to future tasks similar to knot tying. All this is done in virtual reality without explicitly programming the robot to tie a knot. The more accurate description is that the robot is programmed to learn. 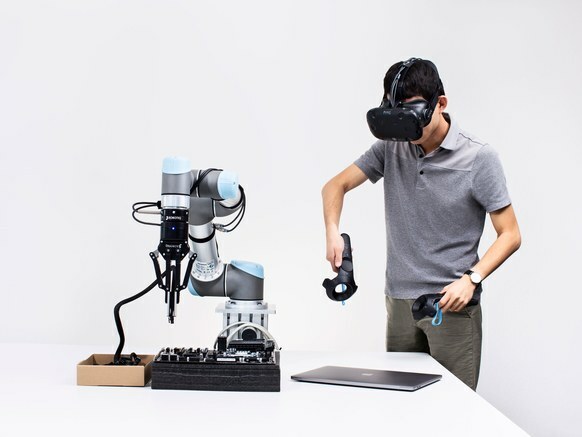 The robot will not be able to perform the learned functions as exactly like people during initial runs, performing only at around 80% efficiency. However this problem can be addressed by reinforced learning which means that the more it performs a task, the better it becomes at performing it.\r\n\r\nEmbodied Intelligence will focus of robotic task that require higher visual motor skills to perform. A good example of high level motor skill for robots is manipulating wires. Perfecting this technology will significantly decrease the amount of time spent in programming a robot in mere minutes.\r\n\r\nWant to know more about this awesome device? Follow this Link!